I have never been a fan of fridge in the slide. Besides too much weight, the venting is less than optimal. Proper venting is very important for propane/electric fridges. Not a problem if it's a 120 volt residential type. Biggest problem involved with installation of an absorption fridge in a slide is that the vent will be in the sidewall rather than the roof, which can cause problems with proper venting of the fridge, which in turn can result in poor cooling performance. Have not had a problem due to weight in our kitchen slide. However the 1200 series Norcold was Nevercold. Partially due to venting I'm sure but it was not in good shape we found once removed. Replaced last July with a 18 CF Maytag that is working well and and is lighter than the Norcold it replaced. Our residential refer is in the FWS...no problems, the slide had four motors. I don’t feel that it is a weight issue, just a cooling issue. I heard the fridge nick name is Nocold. It works well when not to hot outside, would like to add a fan to back, I had heard that helps? Our 2005 fiver had the refer in a slide. Worked great even today after I sold thw fiver last year. It really depends on how careful the mfg was in designing and setting the refer. Weight is rarely a factor in slideouts. They are self supporting. The instructions state the required dimensions for cut-out, the clearances between top/bottom/side walls (0") and back (0-1"), ventilation requirement (baffles/fan kits) ETC. Instructions even give examples with PICTURES!!! Got cooling issues.......look up the specific Brand/Model 'Installation Manual' and correct the screw ups by RV MFG. Our last coach had the refrigerator in the slide and had absolutely no issues in cooling. It was a Dometic, not a Norcold, with upper and lower vents and clearances specified by the manufacturer. We have a residential fridge, and the rest of the galley with cabinets etc etc in a Schwentek operated slide, which is a chapter and a half all in itself. I can tell when we're loaded up, and I make sure the thing doesn't have to go up hill. I wish they would have put a more capable mechanism there. As far as cooling.... residential fridge no problem. Schwintek Systems have issues with an empty small slideout. Not a good design IMHO to move refrig with slide, lots of unnecessary extra weight. Hopefully you are asking about a residential and I guess it depends on who made the slide mechanism. Agree a NoCold 1200 in a slide can be even more of a problem...no thermal siphoning. Our "new" rig has the refer in the slide and while I've only owned a year and I was not worried about the extra weight, Monaco used a robust mechanism, so we have not had any problems. With the refer moving it makes possible a large pantry that you have to move the slide partway out to open so you learn to not put the cereal in there when traveling. The improvement in the handling with a tag is well worth it and once you've owned you will not settle for anything else. I made sure this rig had the TRW steering gear box which I had to adjust as there was 2" of slop for the first 200 miles. Took 4 minutes to fix. If you are still in Fla, there is a overpriced 08 Navigator in LaBelle. I paind $165K a year ago with the same miles. I agree with Ivylog. Our 07 Executive had a large residential refrigerator in the drivers side slide. We never had any issues. However, I do think it matters a great deal on who the coach manuafacturer is and what type of slide out mechanism they use. The large HWH hydraulic slide mechanisms can move almost anything. 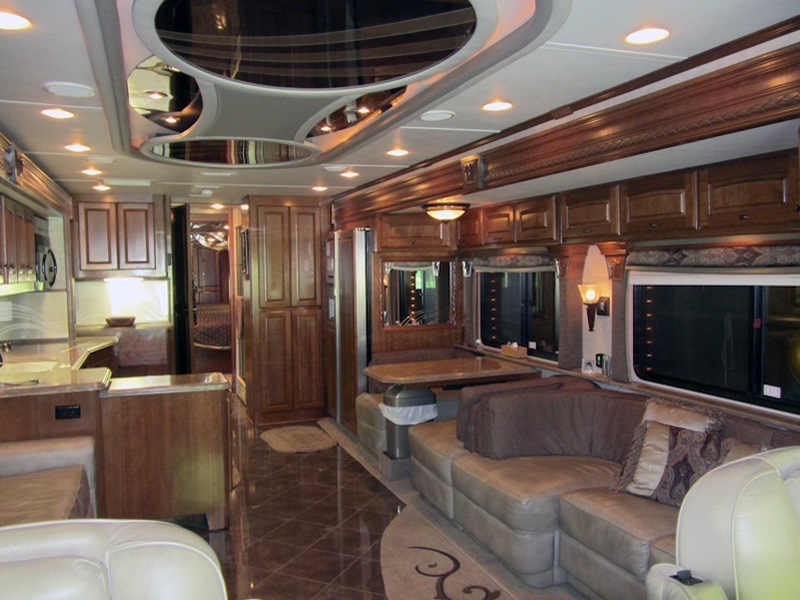 Most of the new large diesel coaches currently built have a full wall slide with a residential fridge.